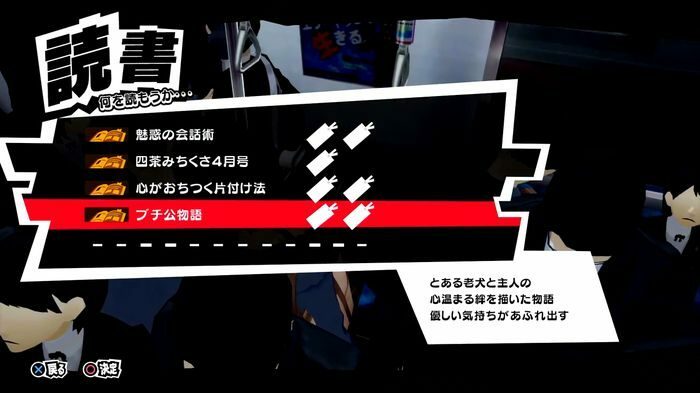 This page contains a list of the Books, Required amount to Read, their Locations and Effects in Persona 5. We will be updating this as we go along. A list of the Books, Chapters to Read, Locations, and Effects in Persona 5. This article contains the Books in Persona 5. It lists the Chapters to Read, effects, and location of each Book. ※ Updated May 5, 2017. Similar to in Persona 4, reading books often grants the protagonist experience in his Social Stats. Certain books may also provide a boost when doing specific activities. This table summarizes the books obtainable and where they are obtained. Namely: Library, Hero’s Room, Shibuya Bookstore, and Shinjuku Bookstore. Musty Pages, Museum of Stars, Tokyo Shrines arrive on 9/1. *-Rough translations were used for most of the Titles. Hi I am so grateful I found your weblog, I really found you by mistake, while I was looking on Digg for something else, Anyways I am here now and would just like to say kudos for a incredible post and a all round enjoyable blog (I also love the theme/design), I don’t have time to go through it all at the moment but I have bookmarked it and also included your RSS feeds, so when I have time I will be back to read much more, Please do keep up the fantastic work.